The recent debate on the role of money in politics has shed the light on the challenges of political finance regulations. What are the risks associated with the funding of political parties and election campaigns? Why are existing regulatory models still insufficient to tackle those risks? What are the links between money in politics and broader frameworks for integrity in the public sector? 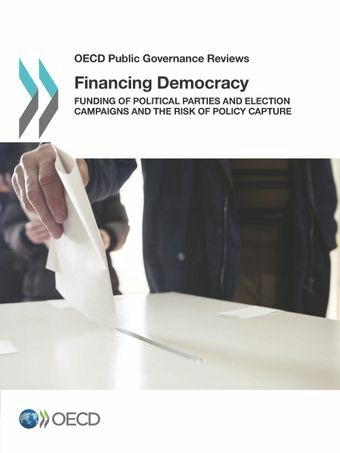 This report addresses these three questions and provides a Framework on Financing Democracy, designed to shape the global debate and provide policy options as well as a mapping of risks. It also features country case studies of Canada, Chile, Estonia, France, Korea, Mexico, United Kingdom, Brazil and India, providing in-depth analysis of their political finance mechanisms and challenges in different institutional settings. What are the risks associated with the funding of political parties and election campaigns? Why are regulatory models still insufficient to tackle those risks? What are the links between money in politics & integrity in the public sector? This report answers these questions and the resulting analysis has produced a Framework on Financing Democracy for shaping the global debate, providing policy options and a mapping of risks. The report will also feature 9 detailed country case studies (Canada, Chile, Estonia, France, Korea, Mexico, United Kingdom, Brazil and India), providing in-depth analysis of their political finance mechanisms and challenges in different institutional settings. Finance is a necessary component of the democratic processes. Money enables the expression of political support. It enables competition in elections. However, money may be a means for powerful narrow interests to exercise undue influence e.g. newly elected officials maybe pressured to "return the favour" to corporations. Infrastructure and urban planning are particularly vulnerable to the risk of policy capture. Consequences include inadequate policies that go against the public interest. Current funding rules need attention to ensure a level playing field for all democratic actors. Loans, membership fees and third-party funding can 'go-around' current spending limits. Countries are struggling to define and regulate third-party campaigning (charities, faith groups, individuals or private firms). While many countries have adopted online technologies to support proactive disclosure. There is a need for more efficient and independent oversight and enforcement. Political finance regulations are ineffective in isolation. They need to be part of an overall integrity framework that includes the management of conflict of interest and lobbying. Fewer than half of OECD countries have set or tightened lobbying standards. The OECD is committed to provide comparative data, benchmarks and indicators relative to financing democracy, integrity in the public policymaking process, and averting policy capture in order to measure costs, identify benefits and monitor performance of existing measures. Countries would benefit from highlighting and sharing good practices so as to identify the conditions for policies and practices that effectively safeguard the integrity of the policymaking process and curb the risks of policy capture by the powerful narrow interests.